13 Above: Thrilling Discovery - Journey To Cleopatra's Skull ? Thrilling Discovery - Journey To Cleopatra's Skull ? Elated archaeologists searching for the lost bodies of doomed lovers Cleopatra and Mark Antony have made a number of important discoveries. In what could be the most thrilling finds since the tomb of Tutankhamun was unearthed in 1922, leading Egyptologists believe they are edging ever-closer to the country's most fabled queen. 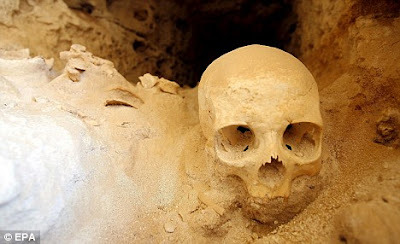 This skull was found during a radar survey of a temple close to Alexandria and workers are hopeful they will also find the remains of the celebrated Roman general. Egypt's top archaeologist Zahi Hawass was optimistic of making a significant find when the dig began last month. 'This could be the most important discovery of the 21st century,' he said. The skull is not confirmed as Cleopatra's but is set to be tested by scientists, alongside a complete body found in a stone coffin. The excavation is hoped to unravel a number of questions that have lingered over the couple, including whether they were buried together, her reputed beauty and their suicide. 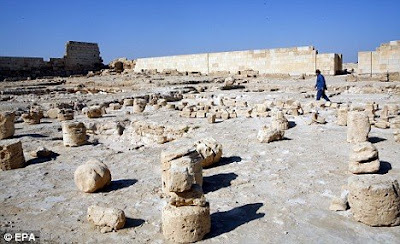 Egypt's Supreme Council of Antiquities said that the three sites were identified in February during a radar survey of the temple close to Alexandria. It is located on Lake Abusir, once known as Lake Mariut, near the northern coastal city and was built during the reign of King Ptolemy II from 282 to 246 BC. Teams from Egypt and the Dominican Republic have been excavating the temple for the last three years. They have already discovered a number of deep shafts inside the holy site, three of which were possibly used for burials. Body: Another important find at the temple. The leaders of the excavation believe it's possible Cleopatra and Mark Anthony could have been buried in a deep shaft similar to those already found. The couple are widely believed to have committed suicide after their defeat in the battle of Actium in 31 BC. Kathleen Martinez, an Egyptologist involved in the dig, said that Roman records suggested that the lovers were then buried together. 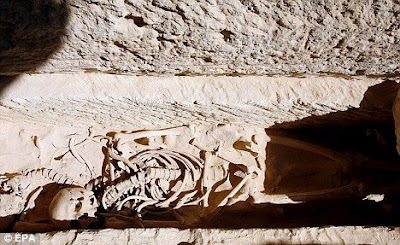 She added that the unearthing of ten mummies of nobles in the area has raised hopes that the lovers could be nearby. But other experts are less convinced. John Baines, professor of Egyptology at the University of Oxford, said it is unlikely that Mark Anthony, who was an enemy, would have a burial place that would have stood the test of time. Hopes of finding their tomb were raised with last year's discoveries at the site of: a bronze statue of the goddess Aphrodite; the alabaster head of a Queen Cleopatra statue; a mask believed to belong to Mark Anthony; and a headless statue from the Ptolemaic era at the excavation site. The expedition also found 22 coins bearing Cleopatra's image. Dr Hawass said the statue and coins - which show an attractive face - debunk a recent theory that the queen was 'quite ugly'. 'The finds from Tabusiris reflect a charm... and indicate that Cleopatra was in no way unattractive,' he said in a statement. Academics at the University of Newcastle concluded in 2007 that the fabled queen was not especially attractive based on Cleopatra's depiction on a Roman denarius coin which shows her as a sharp-nosed, thin-lipped woman with a protruding chin. 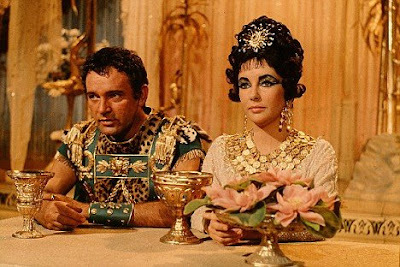 The popular image of the lovers is of Cleopatra played by Elizabeth Taylor opposite Richard Burton in the 1963 Hollywood film of the Egyptian queen. It was during filming that the co-stars became lovers.